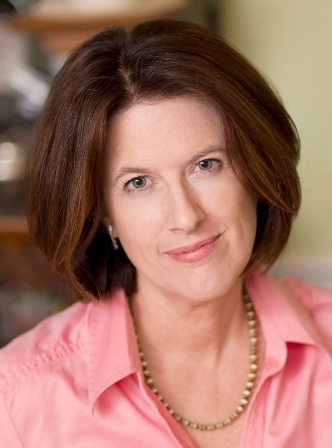 It is with great pleasure that I present a guest post from cookbook author and food writer Wini Moranville. 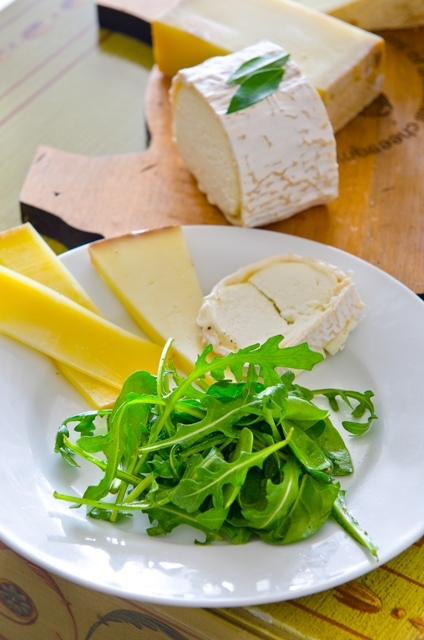 After spending six weeks each summer in France for almost 20 years, Wini has decided to share 250 simple, French recipes that she has perfected over the years. In writing the Bonne Femme cookbook, her goal is to teach the joys of French cooking and show how everyday French food is far from the complicated or “stuffy” cuisine we might imagine. When stateside, Wini writes a monthly wine column for Relish, and also writes about food and wine for Better Homes and Gardens, Country Home, Holiday Celebrations, Creative Home, and the Des Moines Register. You can find more of her tempting recipes and read excerpts from the Bonne Femme Cookbook on her blog: Chez Bonne Femme. Many thanks to Wini for this post in which she shares with us some simple & delicious recipes for easy French entertaining… I’ve already got my cocktail shaker prepped for that French 75, yum! Bonjour and thanks to Tuula for hosting this guest post. While I spend major stretches of my summer in France, winter finds me back in Amerique profonde (roughly, what the French call U.S. fly-over country), where I work as a food writer and editor. Of course, living Great Midwest doesn’t stop me from enjoying great flavors of France (that’s what my cookbook* is all about—any-night French cooking you can pull off no matter where you live). This time of year, I turn to braises—lots of braises—for my weeknight meals. They’re among the most warming, gratifying meals you can serve. Although it’s easy to think of braising as a weekend kind of thing (after all, the technique works great for tough cuts of meat that require interminable cooking times), I noticed that French women got out their cocottes and fait-touts (what we’d call Dutch ovens) quite often during the week. The trick is finding a good cut of meat that braises quickly, but brings all the rich, meaty, bold flavors you want in a braise. Pork shoulder steak, well-marbled bone-in pork chops, and meaty bone-in chicken pieces (especially dark meat) fit the bill. 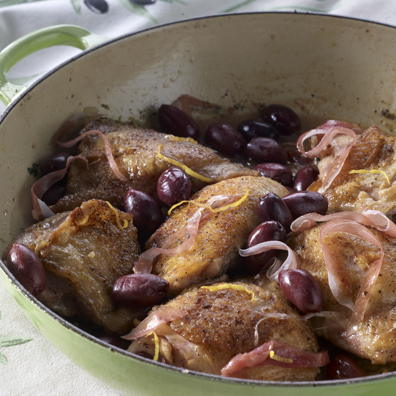 In honor of the South-of-France focus of this blog, I’m showcasing here my Vermouth-Braised Chicken with Olives (vermouth and olives are a classic South-of-France ingredients). The dish will be done in less than an hour, and most of that is hands-off. Yes—you can have friends over for dinner on a busy weeknight. In fact, stews and braises are among my favorite dishes to make for guests. Most all of the prep work is done in advance, so when your guests arrive, you can tend to more pressing needs, such as opening a bottle of sparkling wine or shaking up a great French cocktail…. …..speaking of which, I don’t mind if I do. Below, I give the recipe for one of my favorites—The French 75. It’s a dashing way to kick off dinner with friends. To make this braise into a menu, simply serve it with pureed potatoes or baked rice; follow it up with a cheese course served with a small puff of vinaigrette-tossed salad (that is so French). 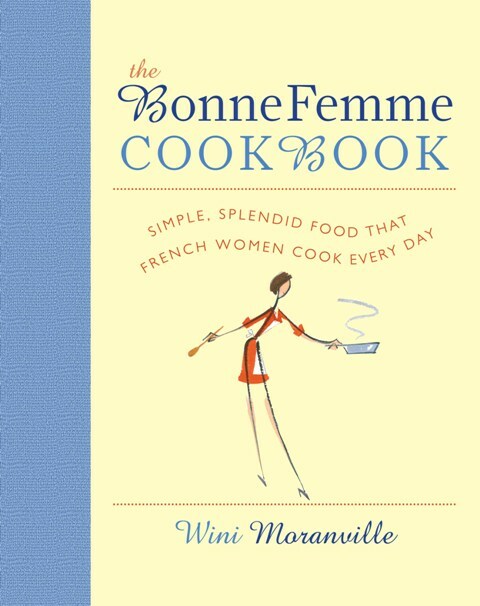 * The Bonne Femme Cookbook: Simple, Splendid Food That French Women Cook Every Day is available on Amazon.com. The book includes dozens of recipes that can be made on weeknights, as well as some weekend-worthy picks. 3. Reduce the heat to medium and add the onion. Cook, stirring, until the onion is tender, about 3 minutes; add the garlic and cook, stirring, until fragrant, about 30 seconds more. Remove the pan from the heat and add the vermouth and chicken broth, taking care not to let the liquid spatter. Return the pan to the heat and bring to a boil; boil, stirring with a wire whisk to loosen any browned bits from the bottom of the pan, until reduced by about 1/4 cup, about 1 minute. Stir in the herbes de Provence, lemon juice, and lemon zest. The French 75 may be my favorite Champagne cocktail of all. The drink was popularized at the famous Harry’s New York Bar in Paris. Mixologist lore claims it was named for the 75-mm cannon used in World War I: That is, the drink packs quite the kick. 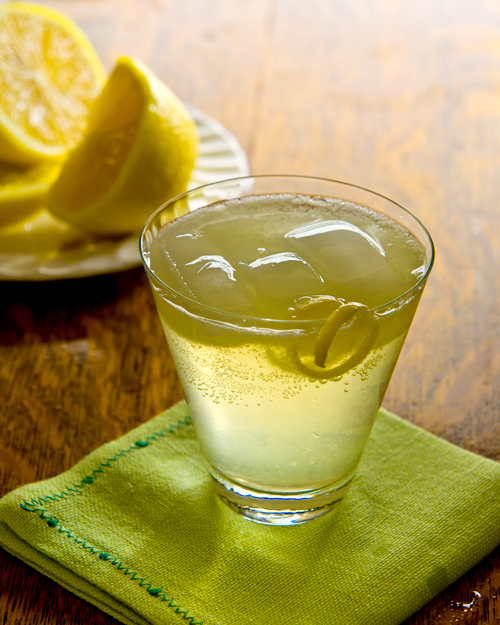 In a cocktail shaker, combine the gin, lemon juice, and simple syrup. Add the ice cubes; cover and shake until very cold. Strain into an ice-filled Collins glass. Slowly fill the glass with Champagne. Garnish with the lemon slice. * If you don’t have simple syrup, simply dissolve 1/4 teaspoon sugar into each ounce of gin before you shake everything together. Another great interview! I’m a fan of Wini’s…..and this chicken recipe sounds delicious. Will try it next week for sure. Thank you both! Thanks Libby, was thrilled to have Wini post on the blog! Great post and I’m a big fan of braises too. I have picked up and browsed through the Bonne Femme cookbook multiple times but now that I have met the author on your blog, I will have to buy it the next time I see it in January. My family prohibits me from buying cooking books between the 1st of November and Christmas as they say I spoil their Christmas shopping. Thanks for introducing me to Wini Moranville. That’s funny Michel, I’m sure your family has great fun shopping for cookbooks for you for Christmas… there are so many I’d love to buy as well. Glad to hear you enjoyed the post and happy cooking!